I understand this is a download item. I understand this item is non-returnable. Archive your photos and videos and experience your memories again and again. MAGIX Photo Manager helps you maximize your photo and video collection. Edit, sort and organize your photos and videos with ease. Import your images from various cloud services directly into Photo Manager Deluxe. This way you can combine your local photo libraries with your cloud services. View and organize RAW files or enjoy videos in AVCHD format. Photo Manager Deluxe supports all conventional photo and video formats. Support of original camera formats (RAW formats) offers more flexibility when image editing. With Photo Manager Deluxe, you can import your media from your scanner or camera directly into the program. The intelligent Selection Wizard uses innovative image analysis to sort out poor shots, duplicates and blurry photos. Virtual albums allow you to assign the same picture to several collections without having to save the image to the hard drive several times. With additional metadata such as names, events or locations, you can search through your photos even faster. Create your own slideshows with impressive transition effects, music and spectacular tracking shots. Share on YouTube or burn straight to CD or DVD. Prevent unwanted access to your images & videos. Create backups of your media from within the program and get automatic reminders. Recover accidentally deleted files with a few clicks. 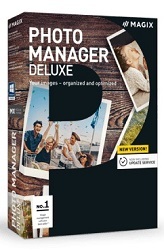 The new Photo Manager 16 Deluxe includes support for .mp4 and .mov video formats and for AVCHD with Windows 8 and higher. The free tutorial videos from MAGIX provide you with an initial look at various MAGIX programs. You'll learn quickly and easily how to use the most important features in order to bring your own projects to life. Finally, a USB mic that's not only easy to use, but sounds as good on your desktop as it does in a pro recording studio. Create entertaining slideshow presentations from your most beautiful photos & video footage. Enjoy a superior HD video quality with the LifeCam Studio, which includes a 1080p HD sensor.